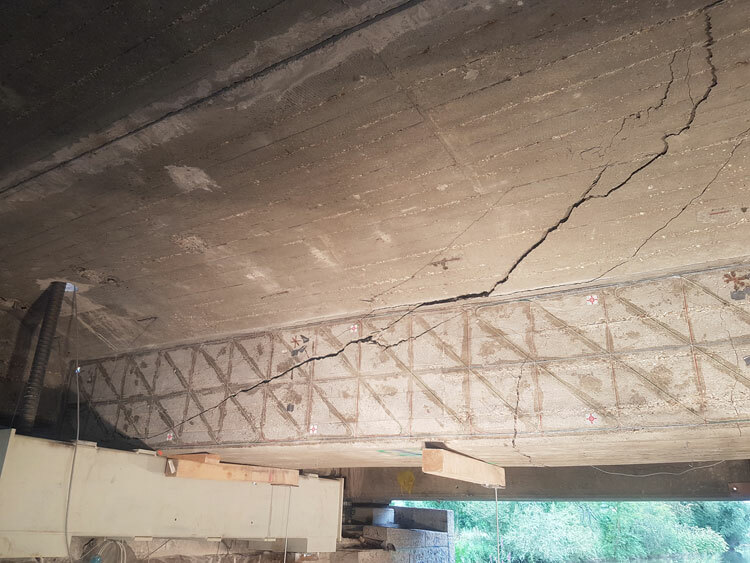 Munich, Germany — In the summer of 2017, researchers from the Technical University of Munich (TUM) pushed the old Saale bridge in Hammelburg in Franconia to its limits: They carried out a total of five load tests, resulting in nasty cracks. In combination with laboratory tests, they hope to determine whether older bridges have greater load reserves than previously assumed. The initial results are now in. Increasing numbers of cars and especially heavy goods transports are crossing bridges. In Germany, more than half of the bridges are over 35 years old. Prof. Oliver Fischer, professor at the Chair of Concrete and Masonry Structures of TUM explains: “That means completely different loads were assumed back in the day when they were designed. And when we recalculate our old bridges using today’s codes and standards, we occasionally see considerable theoretical deficits in many constructions, in particular regarding shear capacity.” In simple terms, so-called shear arises when a force acts perpendicular to the bridge – through road traffic, for example. Internal load-bearing mechanisms direct these forces to the supports, where the shear forces are greatest. In addition to full-scale tests the researchers at TUM designed a new testbed to enable examinations that have not been done hitherto. “Using the innovative experimental setup, it is possible to work with relatively short girder sections and nevertheless simulate the behavior of more or less arbitrarily long continuous bridges,” explains Fischer. But how realistic are the results? The actual load-bearing behavior of an older prestressed concrete bridge was tested on a retired bridge in Hammelburg in the German region of Franconia. It was important to the researchers to find a continuous bridge that extends across several pillars. These bridges, especially, show extremely complex load-bearing behavior near the supports. The experiments at the Saale bridge in Hammelburg are the first in the world to test the limit load capacity of a real, multi-span bridge near the pillars and, together with the laboratory tests, will thus provide new and valuable insights for both research and engineering practice. A roughly 32-meter-long and 1.80-meter-tall heavy steel beam weighing almost 40 tons was installed on the bridge and anchored to the respective pillar axes. The girder served as an abutment for a total of six hydraulic cylinders – when extended, the cylinders exert the same force on the overhead girder as on the bridge. This made it possible to apply a theoretical maximum load of 1,400 tons to the bridge, equivalent to about 1,000 cars or 35 fully loaded semi-trailers. The researchers had to plan very carefully how and where they would load the bridge to produce a shear force failure. “But we were successful in all five tested areas, getting nice oblique thrust cracks,” says Fischer. Evaluating the extensive measurement data will take until the end of 2018. However, the results in so far indicate that the laboratory tests render quite an accurate picture of the physical reality. The first evaluations also confirm the researchers’ assumption that currently used engineering models have room for further improvement. As a result, some of the older bridges may be able to stay in service longer than expected and require fewer reinforcing measures.